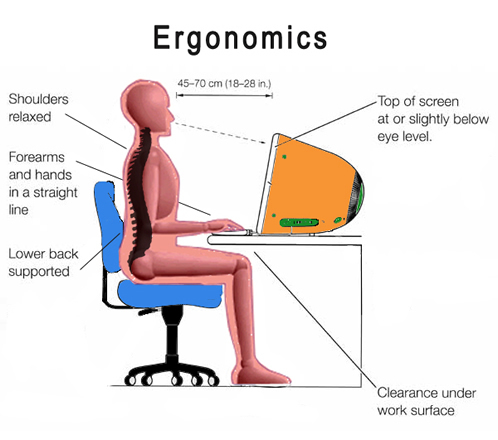 Workplace ergonomics can play a huge role in your productivity, health, job satisfaction, and general well-being. Many people don't spend the time to set up their workstation properly, until they are experiencing some kind of problem. 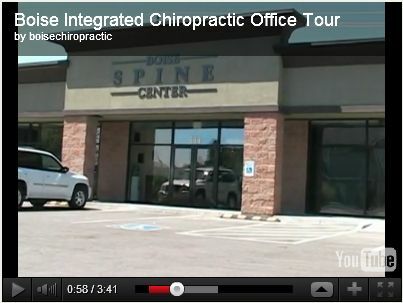 Poor workstation ergonomics can lead to strains, carpal tunnel syndrome, headaches, eye fatigue, back pain, and more. As a general rule of thumb, you want to allow all joints to be in their relaxed state so that minimal effort is required. If you are constantly overusing specific muscles, it will eventually lead to the deposition of scar tissue and muscle strain. At that point, you'll have no choice but to come begging me for treatment. That might be good for my business, but it's not good on my conscience. I want to help you avoid and prevent the common pitfalls of workplace economics. Another rule to consider is that of "the 90s". If you are at a seated workstation (a desk), try to keep your ankles at 90, your knees at 90, your hips at 90, and your jaw at 90. Your computer monitor should be at eye level or slightly below it. Following the rule of 90s will help maintain the curvature in your spine. For additional help on your workplace ergonomics, please talk to Dr. Noah at your next appointment.